A Book Review For You…. We are going to start off with an informal book review of one of my recent purchases. Being such a novice in colored pencil, I think I can provide a perspective that is in line with other artists that does not have a grasp of this medium. And I know just enough, to be smart enough, to say I do not know anything about colored pencils. When I ordered this book, I was extremely excited. 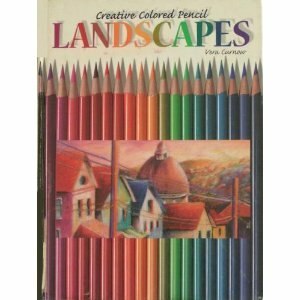 I am starting to have a great love drawing landscapes and there are not many colored pencil books out there that are strictly landscape how to books. So to come across this little gem was a WOW! I have got to have it! kind of moment. But when the book arrived and I read through it, I was extremely disappointed. Do not get me wrong, this is a well written book showcasing beautiful artwork from various artists that we all know and love. But it is not a how to book. Page after page you will see a thumbnail line drawing perspective from an artist with the corresponding color palette and a blurb of what to do (or not do) in a certain aspect of the painting, but that is all you are getting. And I think, sadly, the book description is misleading the readers. It in no way diminishes the beauty of this book and if you are accomplished in this medium, but wanting to branch out into landscape, I can see this being very useful. But for people like me? It’s a look book. Moon Called is a pretty good read. I will not give a synopsis because there are plenty out there and written by a better class of writers. I do not care for the cover, it looks a little juvenile. Mercy ( the heroine of the book) reminded me so much of Kat vonD that she was one who came to mind while reading this book. I think to date Ms. Briggs has seven books in the series and I will definitely be reading the second one. Be Well and Happy Tuesday!